Try Shopboost with 30 Free credits. 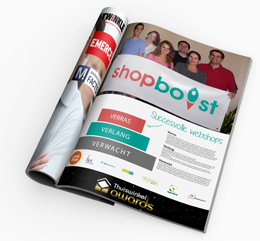 Shopboost is a tool in your webshop and helps to increase conversions and sell more. Shopboost analyses the behaviour of your visitors and detects hesitation. Hesitating visitors are offered a surprise and are persuaded to buy. A surprise can be anything, like a free product, free shipment or discount. Shopboost helps you to sell more by surprizing hesitating visitors. Choose a surprise yourself: discount, free shipment, free product, extra service or advice, etc. Shopboost reduces the number of abandoned shopping carts. Shopboost sends reminders to mobile visitors to order at any other time. Webshops using Shopboost see an increase of their number of orders and their mailinlist with visitors who are really interested in the webshop. Take a lead over competitors and start with Shopboost for Free. Professional Package standard pricing €29,95 each month for Free. You'll receive a link in your mailbox and can start immediately. You can cancel at any time, no commitment. Didn't it work out? We really want to help. This starts with returning the money. Copyright © 2019 Shopboost. All rights reserved.